The biggest question around the 2019 Hyundai Kona Electric has now been answered: it will have a rated range estimated at 250 miles on the U.S. test cycle. Hyundai debuted the U.S. version of the small all-electric hatchback on Wednesday at the New York auto show media days. While the company refers to the all-electric Kona as a "crossover" utility vehicle, it doesn't offer all-wheel drive—although its gasoline counterpart does. 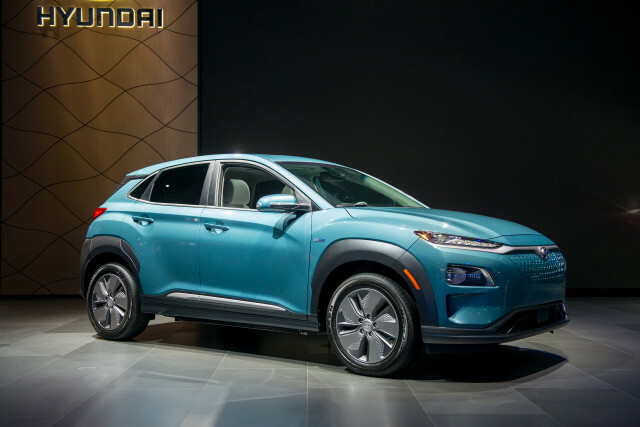 First unveiled at the Geneva auto show two weeks ago, the battery-electric Kona is Hyundai's first long-range electric vehicle but the second in its lineup. It joins the Hyundai Ioniq Electric, the compact five-door hatchback with 124 miles of range—although that model may get a longer range from a battery-capacity upgrade within a year or two. The Ioniq comes as a dedicated vehicle with hybrid, plug-in hybrid, or fully electric powertrains only, whereas the bulk of the Kona models will use a standard gasoline engine. The Kona Electric, however, swaps out the engine and transmission for a liquid-cooled 64-kilowatt-hour lithium-ion battery pack and a 150-kilowatt (201-horsepower) motor producing 291 lb-ft of torque that drives the front wheels. Hyundai estimates its energy efficiency at 117 MPGe, higher than that of the Nissan Leaf at 112 MPGe though lower than the Tesla Model 3 and Chevy Bolt EV. Miles Per Gallon Equivalent, or MPGe, is a measure of how far a car can travel electrically on the energy contained in 1 gallon of gasoline. The version launched for the European market includes a model with a smaller battery pack and lower rated range, but the U.S. will get only the higher-capacity battery. 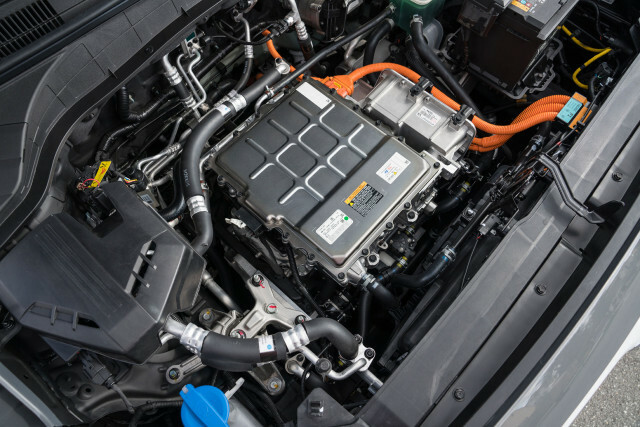 Its anticipated 250-mile range, it should be noted, beats the 238-mile rating for the Chevrolet Bolt EV, also a small upright hatchback, which has a slightly smaller 60-kwh battery. 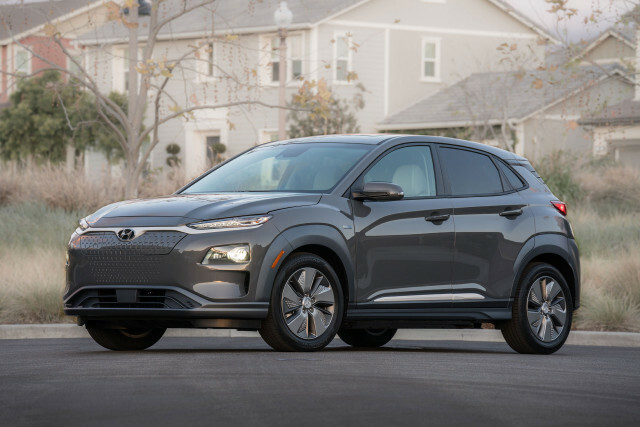 Hyundai says the electric Kona will go on sale in the fourth quarter of this year, with initial distribution in California. It will then be made available in those states that have adopted California's stricter emission limits, the company added, which comes with a zero-emission vehicle sales mandate. Frontal styling of the Kona Electric replaces the gasoline model's grille with a blanking panel for better airflow around the front of the car, to reduce aerodynamic drag that cuts into battery range. Buyers can choose among "extroverted" colors that include Phantom Black, Galactic Grey, Chalk White, Ceramic Blue, and Pulse Red, with the option of a contrasting white roof if the car is not fitted with a sunroof. The 2019 Kona Electric dashboard uses a standard "floating" touchscreen for entertainment and vehicle information. Android Auto and Apple CarPlay are standard, as is the Hyundai Smart Sense suite of active-safety features. Those include automatic emergency braking with pedestrian detection, active lane control, automatic headlights, and a driver-alertness monitoring system. Options include built-in navigation with an 8-inch touchscreen, a head-up display, rain-sensing windshield wipers, and a Qi charging pad in the console for wireless devices. EDITOR'S NOTE: An earlier version of this story noted that the Kona Electric does not offer all-wheel drive, but also incorrectly said the gasoline version didn't either. As several readers pointed out, that was incorrect; we have updated the article, and apologize for the error.